Tale of Saiunkoku is a non-fantasy alternate history anime. 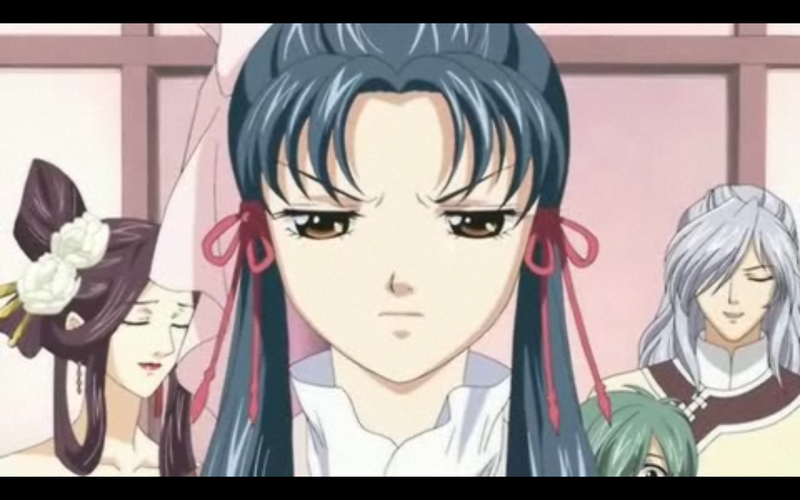 Although it plays at times with being a reverse harem, by surrounding the main (female) character with bishonen, more than one of whom are implied to have romantic feelings for her, the story so far is really about a spunky young woman who, through no fault of her own, is prevented from taking an active part in politics. Uh oh, Shurei is mad again. This review, presented with minimal spoilers is based on viewing the first third of season one. Shurei, the main character is a kind and intelligent girl, who wishes more than anything to take the entrance exam to become a minister at the imperial court. Because she is a woman, and her family is poor (though from a noble lineage) she has no chance of fulfilling her dream. But some of those around her realize she can be of use at the palace, so she comes to accept the position of courtesan to the young emperor. Shurei’s life at court involves convincing the young emperor to take his responsibilities seriously, getting caught up in assassination plots, and, yes, romance. The series’ genre, however, is neither action, nor romance primarily. Principally the series emphasizes Shurei’s service, and secondarily comedy, often associated with Shurei ‘s misunderstanding of exactly what is going on around her (such as the motivations of the emperor, Ryuki). Each episode is titled with an aphorism, or “wisdom saying”, such as, “The Frog In The Well Knows Not The Great Ocean.” The title is usually expressed verbally at some point during the episode, which adds a little flavor of scholars engaged in service at an imperial court. Saiunkoku doesn’t fit into any particular historical period. Instead the story takes place in a fictional empire similar to China (as viewed through the prism of Japanese culture). As such the setting can seem somewhat convenient at times (that is, when required by the plot, the empire seems to expand or diminish in size without any regard for reason, such as when the emperor and his general almost single-handedly fight off the bandits that were threatening an entire province). Still I thought the setting was charming, and enjoyed seeing the different sides of life presented. A show of this sort ultimately stands or falls based upon the attachment the viewers have for the characters. I found Shurei a likable character. She is a bit headstrong, and despite being intelligent and compassionate, she misses some of what is going on around her. I would say she is similar to a Genki type character, that is, she can be loud, and is quick to roll up her sleeves and take on any project. The other characters were mostly likable (or not in the case of the rare villains), but the emperor, Ryuki, in particular, is enjoyable because he is amusing, especially in the ways that his royal background has kept him from learning practical things that most people would take for granted. The animation was done by Madhouse, and although spare at times, it can also be quite pleasing. Although I didn’t care for either the OP nor the ED, the soundtrack makes occasional use of the ehru, a type of Chinese violin, which Shurei learned to play from her mother. This was a really nice touch, and I enjoyed the scenes where she played it. To sum up, although it isn’t a favorite, and occasionally has been predictable, I have enjoyed the show so far. I look forward to seeing how Shurei’s story develops in the second third of the series.